This feature allows you to enhance your Web site by providing tips and suggestions on how to optimize your web page that will improve your Web ranking position on all major search engines. 2. 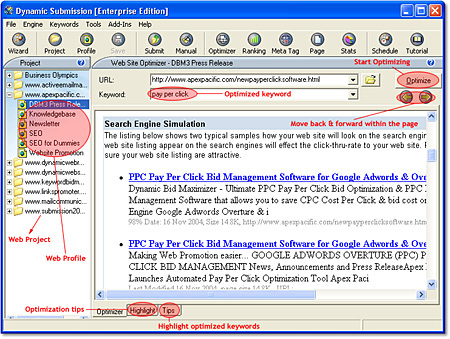 Click “Optimizer” button on the main tool bar to bring up the web optimizer..
3. Simply select the URL from the URL list and keyword from the keyword list, and then click the "Optimize" icon on the right to start optimizing. 4. Alternatively you can also click the “Open Folder” icon next to the URL list box and browse and select a full path to a local HTML files on your PC (such as "c:\webpages\index.html"), click on the "Optimize" button to proceed. 5. The Web Site Optimization Report will be generated. Web Optimizer will check “title”, “keywords" and “description" Meta Tag and the first 200 characters of your web page contents, and then provide you with the tips on how to improve them. This feature will help you "optimize" your web page and get the best ranking on most major Search Engines. You can switch from the “Optimizer” page to “Highlight” page by clicking the tab at the bottom of the screen. The Highlight page will view your web page with the selected keywords highlighted . It is a convenience way to locate and track your keywords location within your web page.